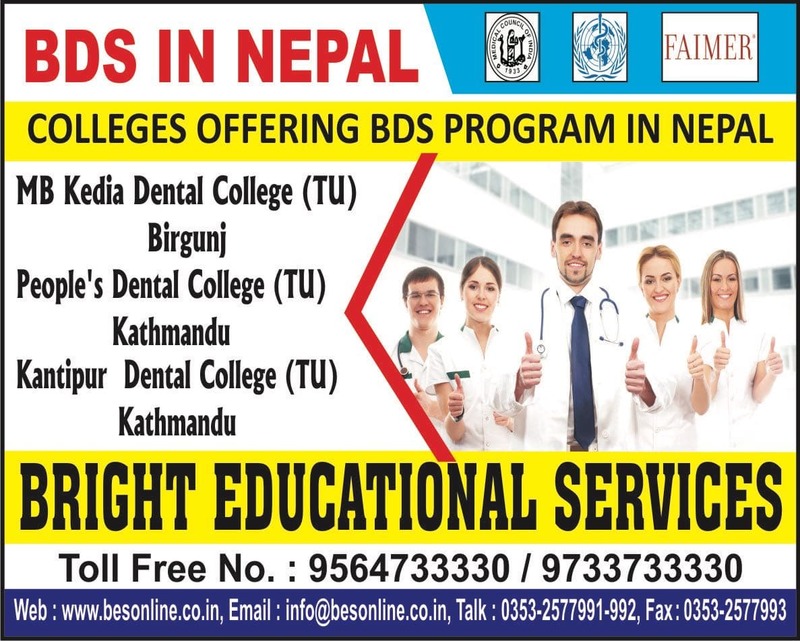 B P Koirala institute of Health Science is an independent institution capable offering brilliant quality medical education to the aspiring students of the nation and abroad. It is located in Dharan region of Nepal. It has innovative learning opportunities for students coming from across the world. It is financed and governed by its own administrative members. The Nepal Parliament has given huge responsibility on this institution to create medical professionals capable of making the nation free from some infectious diseases. It strives to make responsible health care professionals of the country capable of handling critical medical conditions with high degree of confidence. B P Koirala Institute of health Science has set up collaboration with the Institute of Tropical medicine, Antwerp, Belgium and Ministry of Health and Population, Nepal to offer proper training programs for curbing Tropical and Infectious diseases from the roots. The effort is to make Nepal free from some bad diseases that kill many people every year in uncontrolled manner. It was established in the year 1993 in 18th of January. B P Koirala Institute of Health Sciences has been approved by Nepal health research Council and affiliated to Tribhuvan University. 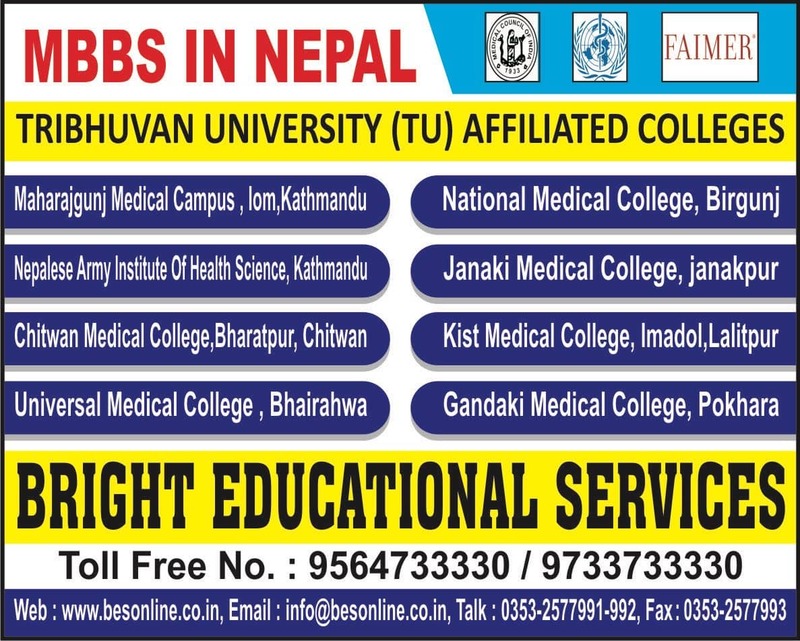 B P Koirala Institute of Health Sciences prepares students with high degree of responsibility. They find jobs in several hospitals, nursing homes and clinics. They can work in army, navy and air force and serve the injured people. They can also be absorbed as faculties in learning institutes and take part in research programs. • Spacious classrooms with good lighting conditions and ventilation. • Teaching faculty is respectable. • Hostels are present for boys and girls. • Library comprises of reading rooms and necessary articles for study. • Laboratories help in practical work along with theoretical studies. • Conference, workshops and seminars are conducted to prepare individuals for facing the job world outside. • Sporting activities are encouraged to keep away monotony. • Complete personality grooming is done along with curriculum studies. B P Koirala Institute of health Sciences, Nepal. 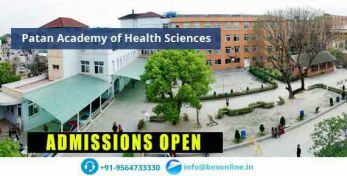 Qus: How to get direct admission in B P Koirala Institute of health Sciences? 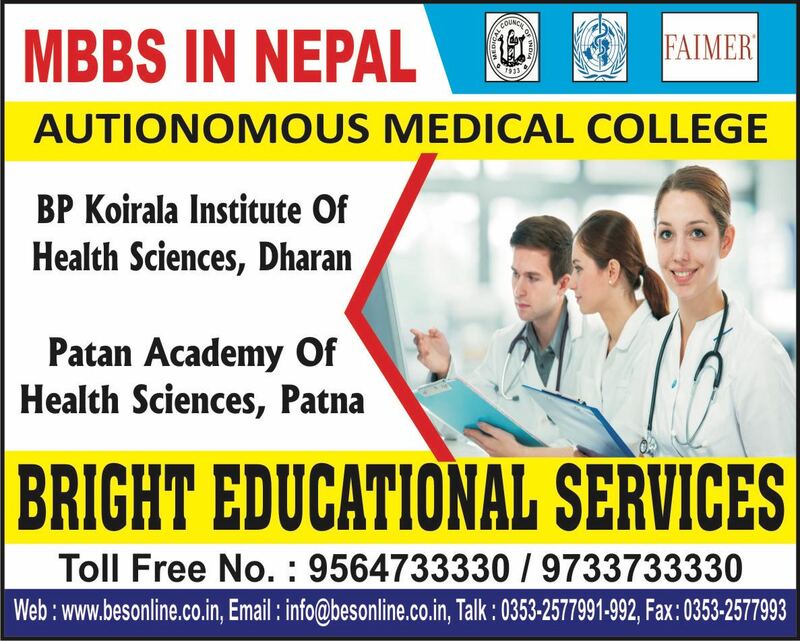 Ans: If you are looking for direct admission B P Koirala Institute of health Sciences , Bright Educational Service is the right place for you which have India's top most direct admission consultants and where we give 100% assurance of admissions in India as well as admissions abroad. Qus: Why do people take admission in B P Koirala Institute of health Sciences? Ans: As per collage standards, B P Koirala Institute of health Sciences is one of the top colleges in india, which is provide better campus recruitment, better quality education and better college campus, better environment, etc. 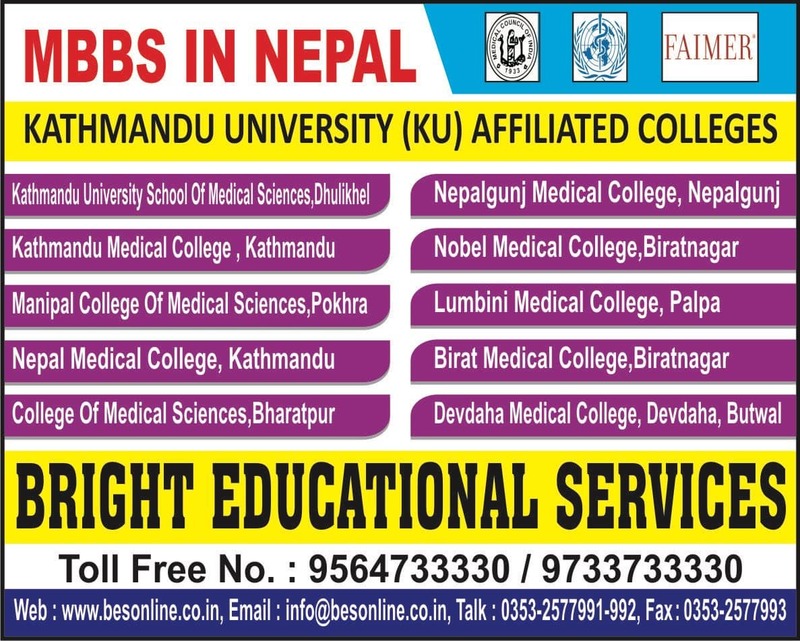 Qus: What entrance exam is needed for getting admission in B P Koirala Institute of health Sciences? Ans: B P Koirala Institute of health Sciences will accept the entrance exam scores of BPKIHS Entrance exam for admission. Qus: Are hostel facilities available for both boys and girls of B P Koirala Institute of health Sciences? Ans: Yes, B P Koirala Institute of health Sciences has separate hostel facility for both boys and girls. Qus: How to apply BPKIHS UG/PG entrance exam? Ans: BP Koirala Institute of Health Sciences conducted PG and UG courses medical/dental entrance exam at every years. Candidates, who interest to get admission in bpkihs, must score the eligible marks in BPKIHS Entrance Exam. candidate follow the steps for appling application for entrance exam. Step 1: Go to official website. Step 2: Find and click "Submit Online Application" button. Step 3: Check the all the application instruction & eligiblity of apply form. Step 4: If fullfill the eligiblity, fill the all mandatory details. Step 5: Attached the original photos, signature and scanned documents as per prospectus. Step 6: Once check filled details are correct or not. Step 7: Then, pay the application form fee. If you need any guidence for UG/PG courses admission, contact @ 9564733330 or fill the enquiry form, our counsellor will be contact you. Qus: What are the infrastructural facilities provided by B P Koirala Institute of health Sciences? 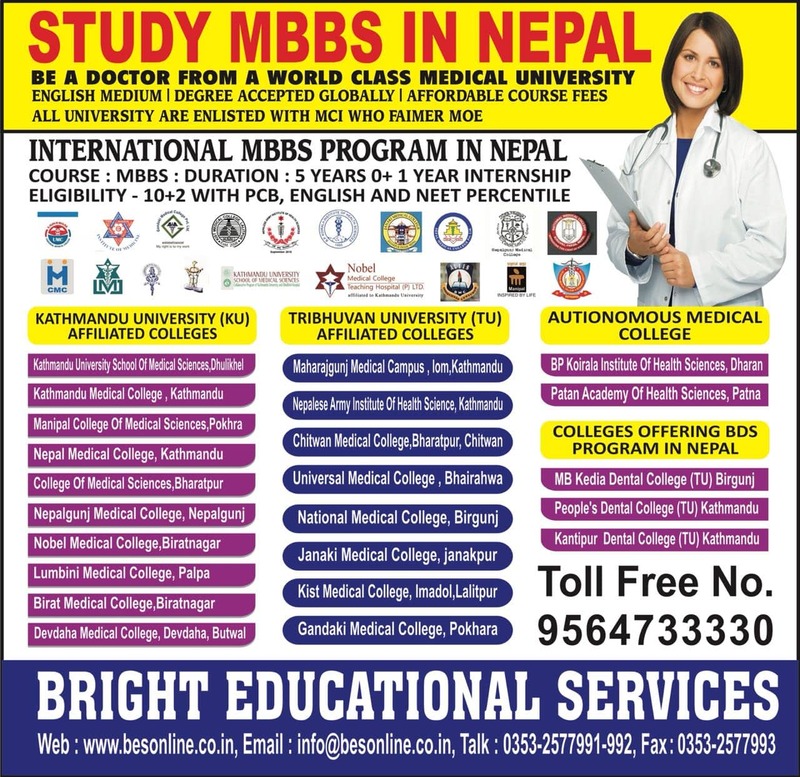 Qus: How do I get PG admission in BP Koirala Medical College, Nepal? Ans: BP Koirala Medical College is every year conducting BPKIHS entrance exam for PG medical / dental courses. 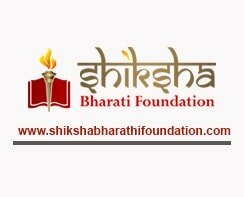 Students must score eligible marks in entrance exam. BPKIHS will be conducted counselling of PG medical/dental admission basis on merit list. Qus: Where is BP Koirala Institute of Health Sciences Campus located? Ans: BP Koirala Institute of Health Sciences is located at buddha road, dharan, a city located in sunsari district in Eastern Nepal, Nepal. Sana siddiqui · 1 years ago.